Under Block ads, turn on Block ads and surf the web up to three times faster. You can turn on ad blocker by going to the Easy Setup menu found in the right side of the toobar. Click Manage Exceptions to set site-specific preferences. By default, a few sites are not blocked. Under Block ads, click Manage Lists. Click the NoCoin (Cryptocurrency Mining Protection) checkbox. Read more about cryptocurrency mining and how we stop this practice here. VPN turns on when you enable it in settings and the blue VPN badge will appear in the combined address and search bar. Click on the badge to see an on/off switch, information about the amount of data transferred, the virtual location, and the virtual IP address. VPN is a free service, and the amount of data you are allowed to transfer is unlimited. To read more about how VPN protects your security, read here. Read more about VPN on the Opera blog. Whenever you select a text corresponding to a monetary value, such as $30, 10.50zł, ¥800, or 2.00 BTC, the search pop-up will convert it to your desired currency. For the currency converter to work properly, the corresponding currency symbol must be highlighted with the numeric value. You can copy the converted value to your clipboard by hovering your pointer over the value and clicking the revealed “Copy” button. The currency converter uses your location at the time you installed Opera to determine your currency, but you can disable this function or change your currency in the settings page. Under Search pop-up, select a currency from the dropdown menu. To disable the currency converter from the search pop-up tool, turn off On text selection, convert currency to. Please note that currencies which share the $, kr, ¥, and the £ symbols will, by default, convert to the U.S. Dollar, Norwegian Krone, Japanese Yen, and the British Pound, respectively, if no other currency abbreviation is highlighted. Currency conversion is based on two reference rates reported either by the European Central Bank (“ECB”) using EURO as its base currency or the National Bank of Ukraine (NBU) using the Hryvnia as its base currency. The default currency converter option is set to the ECB. According to the ECB, its reference rates are updated on working days, excluding TARGET closing days (generally Saturday, Sunday and certain holidays). The ECB’s reference rates are based on a regular daily concertation procedure between central banks across Europe. You can learn more about the ECB’s policy and exchange rates here. Reference rates using the NBU are updated in two groups, daily or monthly, according to the exchange rates of the Ukrainian Hryvnia against foreign currencies. Read more here. Rates are not verified by Opera and you should confirm current rates with your financial institution before engaging in any transaction. In the same way as converting currencies, the search pop-up can convert between imperial and metric units of measurement, such as feet ⇄ meters, gallons ⇄ liters, pounds ⇄ grams, and so on. Celsius and Fahrenheit are also included. Whenever a unit of value in either imperial or metric form is highlighted, the corresponding converted value will appear in the search pop-up. For the unit converter to work properly, the corresponding unit symbol must be highlighted with the number. If you live in London and you come across an unfamiliar time, such as 18:30 KST, the search pop-up can adjust the time to your local time zone. For the time zone converter to work properly, the time zone abbreviation must be highlighted with the hour and minutes included (see the formats below). You may also highlight an accompanying date, such as 17-10-2017, in addition to the hour and time zone abbreviation, and the converter will adjust the date if necessary. The time zone converter uses your system’s location at the time you installed Opera to determine your local time zone. Battery saver makes it possible to browse longer when your laptop is unplugged, as demonstrated in the following time-lapse performance test. The first time your laptop’s power cable is unplugged, the battery saver icon appears next to the search and address field, together with a tip: Save battery and browse longer! If you accept the offer, battery saver will activate every time your laptop is unplugged. If you have not previously enabled ad blocker, you are encouraged to do so; battery saver works better when you also block ads. If you click on the battery saver icon, a dialog appears with an on/off switch, a link to the battery saver options in Settings, and an estimate of the time remaining. You can later enable/disable battery saver, select when when the feature will activate, and decide to always show the battery saver icon by going to Settings > Advanced > Features > Battery saver. Read more about battery saver here. Video pop-out allows you to watch a video at the same time as you are doing other things. Go to a video page, such as Youtube or Vimeo, and run a video. When you hover your mouse over the video, you will see a pop-out button at the top of the video frame. Click the button and the video will detach from the page and into its own adjustable window. Now you can switch to another tab or even another application and the video floats on top until you dismiss it. You can pause, adjust the volume, and select the next video from the pop-out window. If you close the pop-out video frame, the video will continue playing in the source tab. You can return to a video’s source tab by hovering your mouse over the title of the video in the pop-out window and clicking Back to tab. You can save links to pages with bookmarks. Bookmarked pages can be added to the bookmark manager for quick access and organization. You can open your bookmark manager page by clicking the heart icon found in the left sidebar in the start page. Alternatively, you select Bookmarks from the menu bar on Mac or the O Menu on Windows and Linux. Click the heart icon, located on the right side of the combined address and search bar. If you want to change the image associated with the bookmark entry, click the left and right arrows on the sides of the thumbnail. If you want to sort the bookmark, select a folder or create a new one by clicking the dropdown menu. Once created, you can find your bookmarks in the manager. To open the manager, select Bookmarks > Show All Bookmarks on from the menu bar on Mac or from the O Menu on Windows or Linux. Click the pen icon to edit your bookmark’s name or location. Click the X to move the bookmark to your trash folder. You can rearrange your bookmarks by dragging and dropping them on the page. To move a bookmark into a folder, drag and drop the entry on top of the folder, either on the page or in the sidebar. Bookmark folders can be nested within exiting folders or added to your bookmarks bar. Click the New Folder + button next to the Search bookmarks field. Create a title for your new folder. Click the pen icon to create the folder. You can click and drag your new folder, or any other folder, to a different location in the left sidebar. To nest folders, drag one on top of the other. To edit, delete, or select a bookmark folder, hover your mouse over a folder to reveal the edit, delete, and select icons. You can select and manage multiple folders by clicking the checkmark icon on each folder. The icon will turn blue when actively selected. Multiple folders can be dragged and placed in a new location. Use the bar at the top to search for bookmarks by name. Opera will filter bookmarks with each keystroke, looking into every folder, to help you find your page. The switch on the left side of the search box changes how bookmarks are displayed. Select between a grid of images or a condensed list to better navigate your bookmarks. Bookmarks you remove are sent to your trash folder. If you accidentally sent a bookmark or bookmark folder to the trash folder, don’t worry. You can easily bring it back to your bookmark manager. Select the Trash folder at the bottom of the bookmark manager’s sidebar. Hover your mouse over the item you wish to restore. Click the Undo Delete button that appears. Bookmarked pages are restored to the Unsorted Bookmarks folder. Click the Empty Trash button, found at the top right of the page. The bookmark bar adds a list of pages onto a quick-access bar below the combined address and search bar. That way you can get to your frequently-visited sites at any time without having to open Speed Dial or the bookmark manager. Under Appearance, turn off Show bookmarks bar. To add a page to your bookmark bar while browsing, Ctrl+clicking (Mac) or right-clicking (Win/Lin) the bookmark bar and select Add page. You can edit a bookmark’s title on the bar by Ctrl+clicking (Mac) or right-clicking (Win/Lin) the entry and selecting Edit. Ctrl+click (Mac) or right-click (Win/Lin) the bookmarks bar to add a folder. To add the current page to a bookmark folder, click the folder name and select Add Page…. Or, drag an entry from the bookmarks bar into the folder. Creating and using an Opera account with our browsers helps sync all tabs, bookmarks, passwords, and history across all devices. When you’re signed in successfully, the button will display a green check mark. This check mark indicates that Opera is syncing your browsing data to your account. If you don’t have an Opera account, go to Settings > Synchronization > and click Sign in. Then click the Create my Account! button to register. To sign out of the sync service, click the account button and select Sign out. Once you sign out, any data that is saved to your device’s browser will not be synced with your account. For example, if you add a new bookmark, it will not sync to your other devices until you sign back in to your account. Note: Signing out of your account does not remove data from the browser. When you sign out, any data synced to the browser will remain on your device. Similarly, any data synced to your account will remain on Opera servers. Opera syncs your bookmarks, Speed Dial entries, browsing history, passwords, settings, and open tabs with other Opera browsers through an Opera account. Sign in to your Opera account on your home and work computer, your phone and your tablet, and you can pick up where you left off when you switch devices. Once you sign in, the browser pushes all of your device’s browsing data into your Opera account. The same will happen when you sign in on a different computer, on your phone, or on your tablet. Your bookmarks, Speed Dial entries, browsing history, passwords, and settings will be merged onto your Opera account and shared between the devices you sign in on. Read more about how Opera manages your Opera account. Under Synchronization, click the Advanced Configuration button. Select the data types you wish to sync. To view bookmarks from your other devices, go to Bookmarks > Show All Bookmarks from the menu bar on Mac or the O Menu on Windows and Linux. Opera merges each device’s bookmarks and bookmark folders. The sidebar of the bookmark manager updates automatically when you add new folders or bookmarks on different devices. Any changes you make to your bookmarks in the manager will be synced to your other devices. Read more about bookmarks. To view and manage Speed Dial entries from other devices, open the bookmark manager by selecting Bookmarks > Show All Bookmarks from the menu bar on Mac or the O Menu on Windows and Linux. 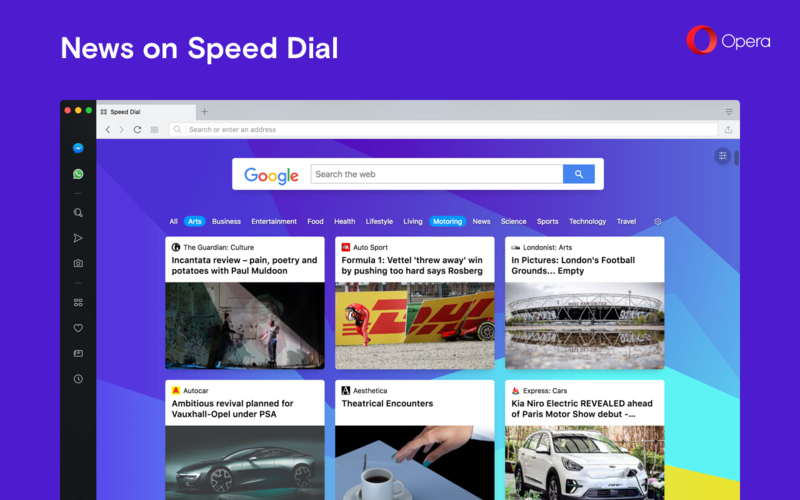 Opera organizes your devices’ Speed Dial entries like bookmarks. To view, edit or remove Speed Dial entries on all your devices, click Other Speed Dials in the sidebar. To view your combined browsing history, select History > Show All History (menu bar on Mac; O Menu on Windows and Linux). You can also access your History page by clicking on the clock icon in the sidebar from the start page. Opera merges the history of each of your devices onto the history page. Clearing items from your history clears them from the history of all devices that you are signed into. Read more about clearing private data. By default, your passwords are encrypted using your Opera credentials. Only encrypted password information is stored on Opera’s server and delivered to your devices. Opera uses your account credentials to decrypt passwords when you sign into your account on your other devices. When Opera receives and decrypts synced passwords, they are stored in your computer’s Keychain. Under Encryption options, select Encrypt all synchronized data with your own sync passphrase. Enter your desired passphrase, confirm the phrase, and click Save. Click Advanced in the left sidebar, and click Privacy and security. Under Passwords and forms, click Manage passwords. Note: Removing passwords from Opera’s password manager and your Opera account does not remove password data from your local machine. Any synced password data will remain on your device and must be managed through your operating system’s password storage. To view open tabs from other devices, select the Tabs button from the sidebar on the start page. Read more about synced tabs. Popular messengers can be found within Opera’s sidebar. With these integrated messengers, you can continue chatting with your family and friends in an easy-to-open panel as you browse to different web pages. You will no longer need to continually find and return to a tab with the messenger when needing to respond to a message. Facebook Messenger, WhatsApp, Telegram, and VKontakte are integrated and available in Opera. After logging in with your appropriate account for the messenger, you will find all your contacts and current message threads ready. Having these messengers readily available works great when you want to quickly share a screenshot you’ve created with snapshot. Under Sidebar, click Manage Sidebar. Select which messengers you want available in the sidebar. Here, you can also enable or disable notification badges for your messengers. You can also Ctrl + click (Mac) or right-click (Win/Lin) the sidebar from the start page to open the sidebar context menu and select which messenger or other sidebar elements to have present. You will be able to log in with your appropriate messenger account after clicking on the messenger’s icon. Each messenger can be opened by clicking on its icon, and then closed by clicking the icon again. With one of your messengers open, you will find a menu in the top-left corner, and a pin icon in the right corner. Clicking the icon will open the options to mute the messenger of notifications, hide the panel, or log out. By clicking the pin icon in the top-right corner of the panel, the messenger will remain open as you browse across the web. Click the icon again to unpin the messenger. Personal news helps you discover new and trending topics. It is a collection of recommended web content from news to sports to arts, and more. Catch up on your region’s most-read news under Top 50. Clicking on the newspaper icon in the left sidebar of the start page will take you to the personal news feed. When you find something interesting to read, click on the entry to open the full news article in a new tab. Go to Personal News > Top 50. From the dropdown menu, select a region/language. 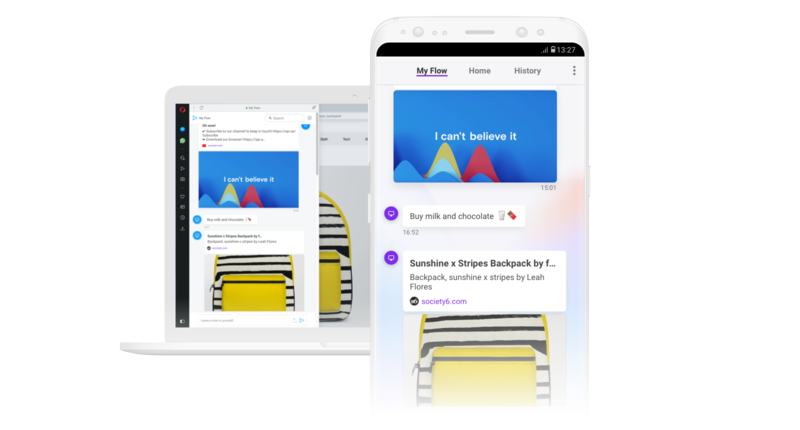 The news feed will refresh with the latest content. From the left panel, select My sources. Search for your source in the text field, or select from the recommended or topical sources below. You can select when Opera’s news feed will refresh with new, trending content. You can select from a frequent 5 minutes, to a longer sixty minutes, or to never. By selecting never, the news feed will refresh only when you reboot the browser. Under Personal news, select an interval from the Check my sources for new content dropdown menu. You can be notified if a website you are visiting has an RSS feed available for your news feed. A blue newspaper icon will appear in your address bar. To be notified of available news feed sources, click the Show available news feeds on address bar checkbox under Settings > Advanced > Features > Personal news. News on start page provides the most popular news articles from the web according to the languages and regions of your choosing. Scrolling down below your Speed Dial folders will open news dials for you to read. Click on an article dial to open it in a new tab. Under Personal news, turn on Show news on start page. Multiple categories can be selected to filter the content you wish to appear on your the start page. 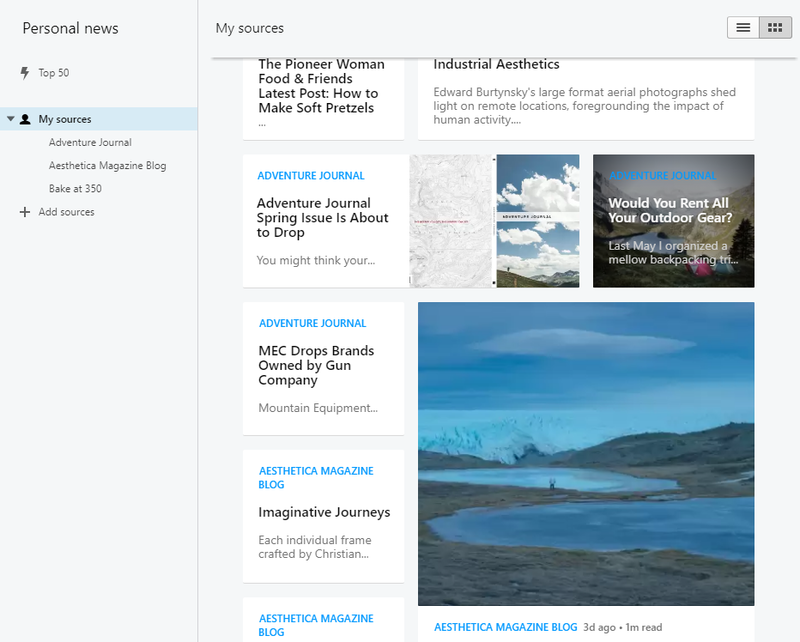 While viewing the news on the start page, select All to receive news from all topics, or select individual topics for a personalized news feed. You can choose multiple languages and regions in the cogwheel icon on the far-right side of the categories bar. Opera’s snapshot tool is a built-in screenshot feature for your browser, allowing you to capture any part of a web page. Snapshot includes editor tools so you can customize, highlight, and have fun with the screenshots you capture. On a web page, press Shift + Ctrl + 5 (⇧ + ⌘ + 2 on macOS). Adjust the frame to crop the part of the web page you want to capture. You can select Capture Full Screen to take a screenshot of the entire page currently visible on your screen, also known as the viewport. Alternatively, you can initiate snapshot by clicking the camera icon in the right side of the toolbar. After capturing the screenshot, editing tools will be presented. These include zoom, arrow, blur, pencil, selfie camera, and emojis. Clicking Copy and Close will copy the image to your clipboard, ideal for quickly pasting the image to a message in the integrated sidebar messengers. If you wish to the save the image to your system, click Save Image. The image will be saved as a .png file in a location of your choosing. My Flow is the space shared between Opera Touch and your Opera desktop browser where you can send links, YouTube videos, photos, and personal notes and access them at any time from your connected phone or computer. This is a great way to keep articles, recipes, travel ideas, and more from the web with you at all times. Content such as videos or audio files can be played within My Flow or opened as a new tab. All content will remain in My Flow until you decide to delete them individually or entirely. To send a web page to My Flow, simply click the button in the address and search bar. You can also highlight text on a web page and click Send to My Flow in the search pop-up. Notes can be written in My Flow by typing in the text bar at the bottom of the My Flow panel. To delete individual items from My Flow, hover your mouse over the item, click the button, and click Delete. To clear all content from My Flow, go to My Flow’s settings and click Clear My Flow. Content that is deleted will not be available to any connected device. If new content sent to My Flow does not appear in the panel, you may need to refresh or reset My Flow. To refresh My Flow, click the button at the top of the panel. If refreshing fails, you may need to perform an Emergency Reset. Click the menu and click Emergency Reset. After the emergency reset, you will need to re-connect My Flow with Opera Touch. How do I connect My Flow on Opera with Opera Touch? Launching Opera Touch and My Flow for the first time will take you through the connection process. 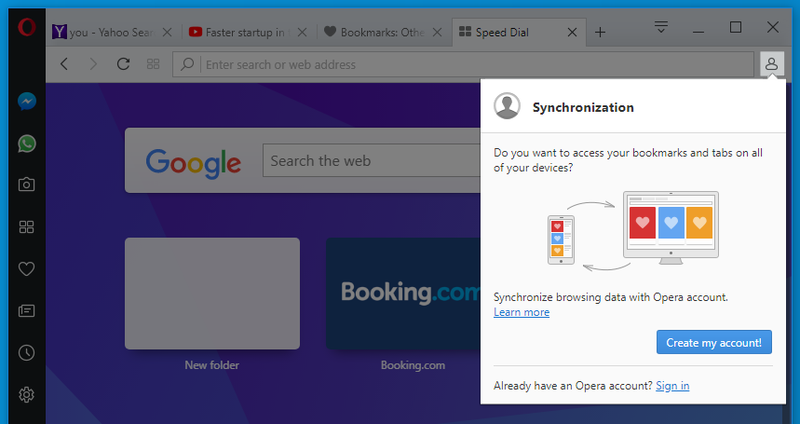 For more information on how to connect devices to My Flow, click here and read from the Opera Touch help page. 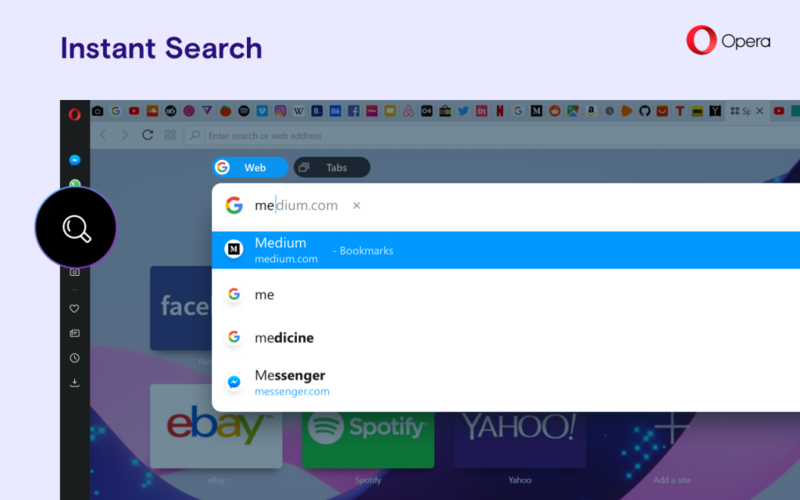 Instant Search is a fast web and tab searching feature which can be used almost entirely from your keyboard. At anytime while browsing in Opera, press Alt + Space to pull up Instant Search. Typing a query will offer results from your default search engine, your history, or your bookmarks in a floating window. You can also search for an open tab through Instant Search, a useful trick if you have several tabs sourced from a similar web page. The floating window will appear over your current web page and will present the results of your search. Clicking on a link will open the results in a new tab, or you can choose to dock the search results in a new tab. No matter when you decide to dock Instant Search into a new tab, the full search context will be kept so you can navigate back and forwards. To open and use Instant Search, press Alt + Space on your keyboard and type your search. Press Enter to receive results in a floating window, or press Ctrl (⌘) + Enter to find results in a new tab. When clicking on a link from Instant Search, the link will open in a new tab. The search context will be kept in this new tab so you to go back to the search results page. Press the → arrow key on your keyboard to highlight the search field to start a new search. Press Alt + Space again. Click outside the floating window. Press Alt + Space on your keyboard. Press Tab on your keyboard to switch to tab search mode. Type in keywords to find the tab. Click on a tab result to open the tab. Opera is the first major browser to integrate a native crypto wallet. The Ethereum-based wallet makes Opera capable of exploring Web 3.0 while also enabling you to make transactions with cryptocurrency and manage their tokens and collectibles. Opera Crypto Wallet first launched on Opera for Android in July 2018. Opera for computers can sync with your Crypto Wallet, allowing you to send and receive cryptocurrency, explore Web 3.0, and manage your ERC20-compliant collectibles and tokens directly from the computer browser. Transactions with cryptocurrency made on your computer are signed off from your Opera for Android browser, adding extra security to your online payments. Read more about the Crypto Wallet for Opera for Android here. Visit our tutorial to learn how to use the wallet and how to sync it between your Opera browser for computers.